WASHINGTON -- Indiana Gov. 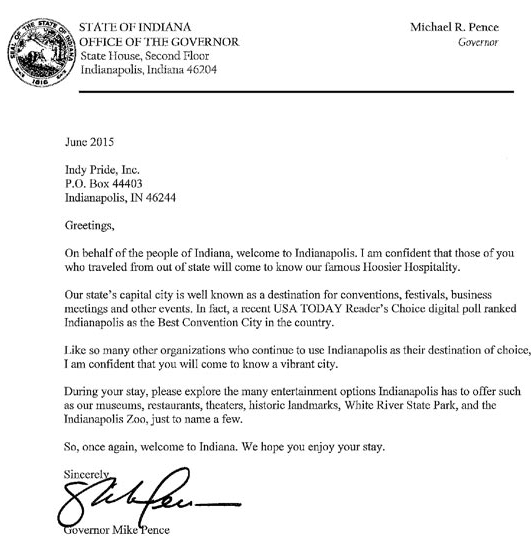 Mike Pence (R) has issued a letter welcoming visitors to Indianapolis for its upcoming Pride Festival, an attempt to assure the lesbian, gay, bisexual and transgender community that no, the state doesn't really hate them, despite the recent "religious freedom" controversy. "On behalf of the people of Indiana, welcome to Indianapolis," Pence wrote in the letter released this week. "I am confident that those of you who traveled from out of state will come to know our famous Hoosier Hospitality." The pride festival, taking place June 6-13, bills itself as "by far the largest gathering of the Lesbian, Gay, Bisexual, and Transgender community in the State." Pence has had a toxic relationship with the LGBT community. In March, he signed the Religious Freedom Restoration Act, which would have allowed any individual or corporation to cite its religious beliefs as a defense when sued by a private party. Many opponents of the bill pointed out that because the legislation's language was so broad, it would have opened the door to widespread discrimination against LGBT individuals. After significant backlash both nationally and within Indiana, Pence eventually signed a revised version of the measure that made clear RFRA could not be used by businesses to discriminate on the basis of sexual orientation and gender identity. But the damage had been done. Pence has seen a precipitous drop in his approval ratings, and the state has had to hire a public relations firm to repair Indiana's reputation. The frustration with Pence has extended even to members of his own party, who are worried that he may have tarnished the state GOP's brand and chances in the next election cycle. According to the Indianapolis Star, the group Indy Pride, which organizes the event, requested the letter from the governor during the RFRA debate to demonstrate Indiana's inclusive spirit. "What better way to show that Indiana is open for business and not targeting certain groups than for the Governor of Indiana to put out the welcome mat to these visitors," wrote Indy Pride. Jennifer Wagner, a spokeswoman for the pro-LGBT group Freedom Indiana, said Wednesday that Pence's letter was a "nice gesture" but didn't go far enough. "[T]he only way to make it clear that our entire state truly is open to and protects everyone is to pass a statewide nondiscrimination law that covers sexual orientation and gender identity," she said. "Indianapolis already has those protections in place, and it's exciting that Republican Indianapolis Mayor Greg Ballard will be the grand marshal of this year's parade." "Freedom Indiana will be at Pride events across our state this month, and we hope the governor will welcome attendees at every one of those events and make it a priority in the 2016 legislative session to fix the damage done by RFRA with a nondiscrimination law that makes it clear that LGBT residents and visitors alike are welcome and protected in our state," she added. Pence has said that passing nondiscrimination protections for LGBT people is not on his agenda. Although the language in Pence's letter is quite vague -- he doesn't even explicitly mention the LGBT community -- it has incensed at least one group, the conservative American Family Association of Indiana. "Governor Pence did not express support for the agenda of Indy Pride, in fact it was a rather benign letter, but the fact that it was sent at all, is a move that he, or his advisors, should not have even considered," wrote AFA in an email to supporters. "It wasn't politically necessary, or wise. Everyone knows that Indiana is a good state and that people are free to do as they choose, but that does not mean such 'freedoms' or all actions should be validated by government leaders." This piece has been updated with reaction from AFA.